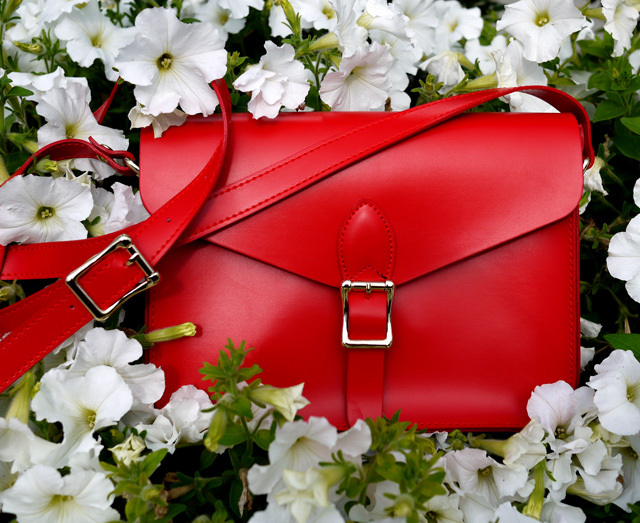 I'm in love, love, love with my new red messenger bag by Angela + Roi (c/o Modavanti). It's that perfect color of poppy red that can work in every season, but it really shines against dark winter and fall coats. Bonus: it's 100% vegan. I gave it a test drive for a day of shopping last weekend and I really liked how the boxy shape allowed enough room for my camera, make-up, keys and wallet, with plenty of space to spare. I'm deeply grateful to each and every one of you for joining me in my efforts to build a kinder, more sustainable wardrobe, so I'm pleased to be partnering with sustainable retailer Modavanti to give away one of these beautiful, bright, cheery bags to one lucky winner. It's my own small way of saying "thank you." Of course, if you have to have the bag right now, you can order one from Modavanti, and be sure to take 15% off of your total purchase with code MYFAIRVANITY. You can also feel good about your purchase: for each bag they sell, Angela + Roi donates $5 to a worthy cause. In the case of their red bags, for example, $5 from the purchase of each one will support the AIDS Foundation of Chicago. Wearing a consigned coat and cashmere sweater dress with AGL brogues and an Angela + Roi vegan cross-body bag.